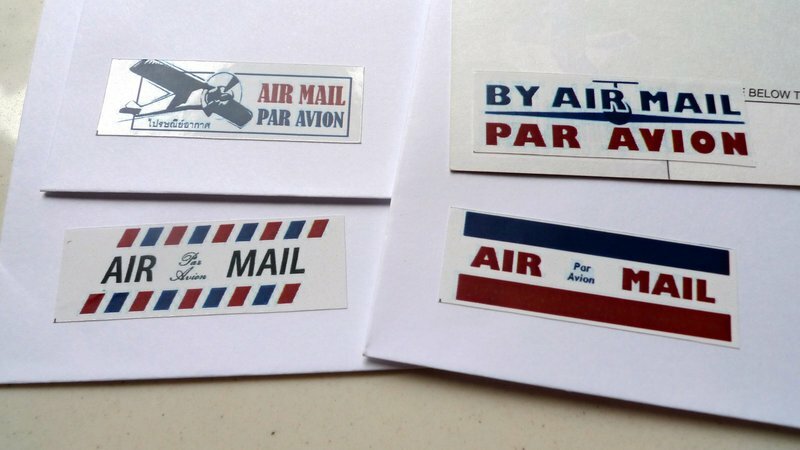 In early February I shared 14 designs I had created for “air mail” stamps and stickers. Since I’m a fan of letter writing, I thought it would be fun to have some diversity in terms of how I indicate that my letters and postcards should travel first class air mail. You were all very generous in providing your feedback and after taking your feedback to heart, I selected two designs to turn into rubber stamps and four designs to turn into stickers. And the stickers. The quality of the printing is pretty poor. They just used adhesive paper run through a color laser printer. But it is a good first batch and I’ll seek out a higher-quality printer in the future. Considering that I now have something like 400 stickers, that won’t be anytime soon! Now, as to the topic of letter writing, just a reminder that April is National Card and Letter Writing Month. If you haven’t used this low tech way of staying in touch in a while, why not make it a point to sit down a write a few letters to friends and loved ones? This entry was posted in Uncategorized and tagged Air, Design, Letters, mail, Stamp, Sticker by christao408. Bookmark the permalink. Do you accept online orders? I occasionally send ‘snail mail’ to my parents. Is this another career? I like the designs. And I did write in long hand a letter to a friend. 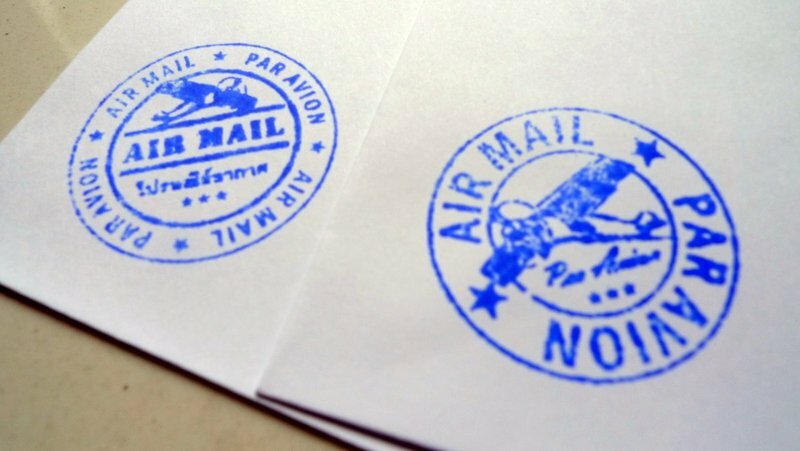 @Redlegsix – Those red-and-blue lined air mail envelopes are still available here in Thailand, yes. @Fatcat723 – Oh, gosh – not another career at all! @CurryPuffy – Let me know which design you want!